MULTIPURPOSE: Except for a laptop table, it is also a breakfast tray, reading desk, coloring table, working desk, etc. It perfects in bed, on the floor, sofa, recliner, car, and even traveling. ADJUSTABLE DESIGN: Adjustable legs' length and 4 slots tray tilting angles for better viewing experience. High adjusts from 7.87-11.81Inches / 20-30 cm. 100% BAMBOO RESOURSES. 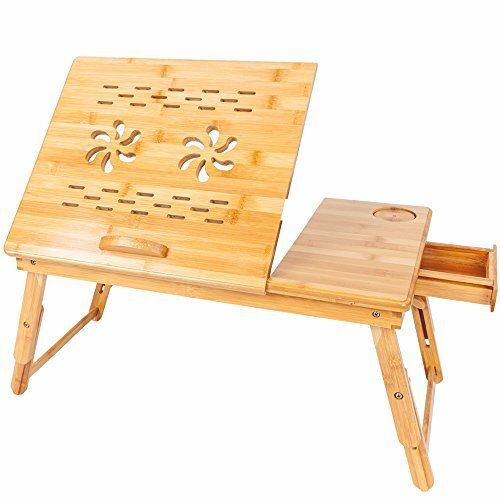 We adopt 100% natural bamboo and made it with our exquisite craftsmanship, providing you smooth surface desk. Present a gift, we'd better give the best quality one, even at package. CONVENIENT DESIGN: Small drawer with Built-in Magnet for storing pen, note pad or phone without worry of the drawer rolling out. A stopper prevents your lap from slipping from the desktop. Foldable legs make it portable. When legs are folded, it is slim enough to be stored in any small space. PORTABLE LAPTOP DESK: Product Size: 20.9''L x 12.8''W x (8.3-11.2)''H (50 x 33 x 21-28.5 cm). Lightweight and foldable, easy to carry, easy to clean.